The WordPress.com stats helper monkeys prepared a 2012 annual report for this blog. It’s nice feedback and, though I really started this blog to explore my own thinking, it’s nice to think that it’s sometimes of interest to others. Thanks everyone who’s read, or commented this year. Happy New Year! It’s a conversation that came back to me this week as, being on holidays, I’ve had time to looks at some new poems and contemplate the writing year ahead. Should I bother with the blog? I’ve read in some places that blogging is dead and that the interest has moved to micro-blogging like Twitter (which I also use, for a different purpose). Would it be better to put all my scant time and attention to the poems themselves, and leave the reflecting elsewhere? Which is what I should have told the puzzled poet I was trying to do here. Reflect on my writing. Reflect on my reading. Share some of that, and some of the good things I’ve found along the way. It’s as much for my benefit as anyone else’s; to overtly think about the writing process and progress. All of that. So, I’m going to keep on blogging for the moment. Irregular as I am with all this, and if I see that poet again I’ll be clearer about what the purpose is for me. The series of radio and tv specials this week recalling the September 11 terrorist attacks in 2011 as the tenth anniversary of that terrible day draws near reminds me that this blog too is ten years old this month. I started this poetry blog because I was fascinated with the internet thing and not confident that the static web site would draw readers in. I’m not sure there’s lots of readers here either, but I admit to another motive: to record for myself my own thinking and reflecting on writing and reading. That’s still my main reason for writing this. thoughts, meditations, reflections; what’s going on with my writing and reading, an ongoing saga! Walked along Bird Rock beach this morning in the cold wind; early enough to be the first footprints for the day; choppy little waves and not a lot of beach but good to see the concrete remains of something (pier?) again unburied at the point. The foundations come and go irregularly. No seal sighted this morning, but I was thinking of trying to write a poem about that encounter a few weeks ago and the line ‘webbed hand’ kept coming to me. I thought of the Barry Lopez book I’ve been reading; “Arctic Dreams” and his encounters with nature. Odd to find as well a balloon still inflated and jammed under the low bushes, then a green tennis ball floating in the shallows and finally an orange in the sand; these three round shapes in all the wind and sand and flat shapes of the world. It did become a poem. Much later. And the blog has morphed and ebbed and flowed as life and the energy you have for writing and reading ebbs and flows too. It is part diary, part journal, part reflection, part publicity, part reading log, part conversation. Probably not quite enough conversation. But that’s okay too. Ten years later I’m still writing this. Still reading and trying to write poems. I still go down to Bird Rock Beach and walk that uneven edge that makes me limp along in the late yellow sunlight, with the bay and the birds and ideas coming ashore sometime like weathered green tennis balls. 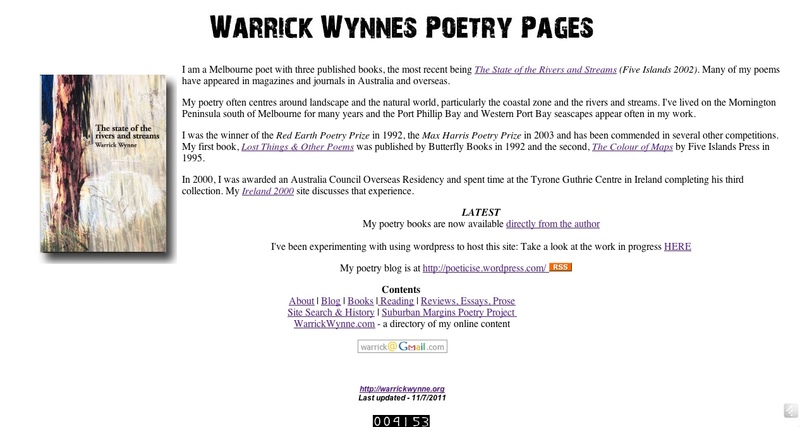 I spent a day or so over the cold mid-year break moving my poetry home page from an HTML based construction I’d created myself to the same sort of WordPress platform that this blog runs on. You might not notice much difference; the address and much of the content remain the same but it might mean that I’m able to concentrate more on the content, and less on getting the back-end all working correctly. I learned a fair bit about how to use Dreamweaver, and how to write HTML but I’d rather be coding the poetry itself. For the record, this is what the old poetry page looked like on the day I closed it down and moved it across.